Top 10: Best WiFi Card For Gaming of 2019! 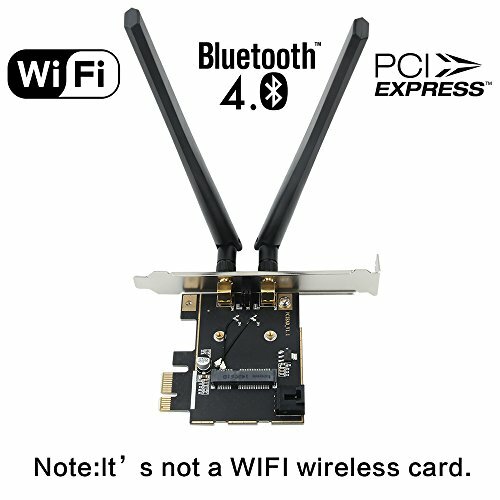 What is the best wifi card? There are so many options to choose from, you can lose your mind sorting them out. While convenient to be able to connect to a hardwired ethernet connection when able, sometimes the extra cords can get in the way, and become a real hassle when making room available for your custom computer. This is why, when creating your computer, you may want to consider putting a wireless adapter into your build. It eliminates unwanted wires, and, with the right adapter, provides internet speed that rivals even the best wired connections. That is where our list comes in today, as we’ll be taking a look at some of the best PCI Wireless Adapters that are available for purchase. 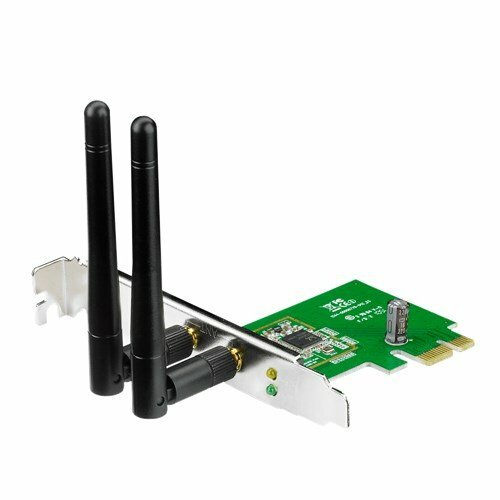 These wireless adapters connect to any PCI port within your custom build, and allows you to connect to wireless networks with ease. With that in mind, let’s take a look at top ten PCI adapters! 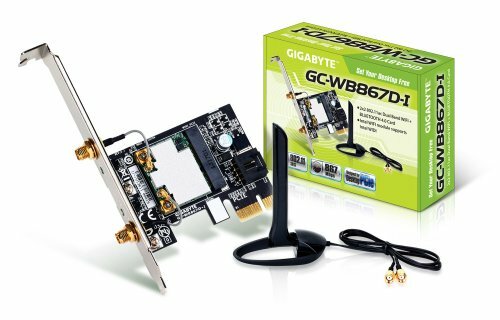 To top off our best PCI wireless network adapters list today, we are showcasing an adapter that is not only a great fit in any custom build, but affordable as well. 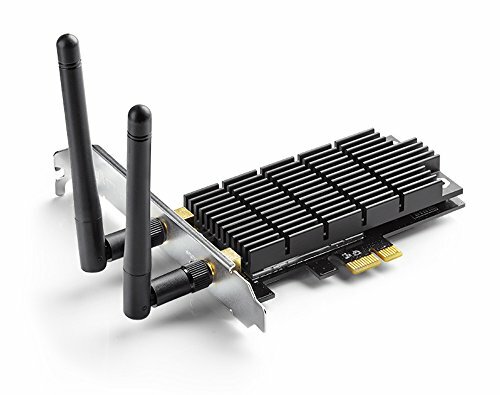 This adapter is the TP-Link N150 Wireless PCI Adapter. Compatible with most internet connections and security types, from WPA to WEP, installation of the TP-Link is super easy- allowing for plug-and-play capabilities. Once connected, if you do not wish to mess around with passwords and such, the TP-Link supports “Quick Secure Setup” (QSS), which allows you to connect to your wireless connection with the simple press of a button. The real star of the show here, however, is how affordable the TP-Link is. 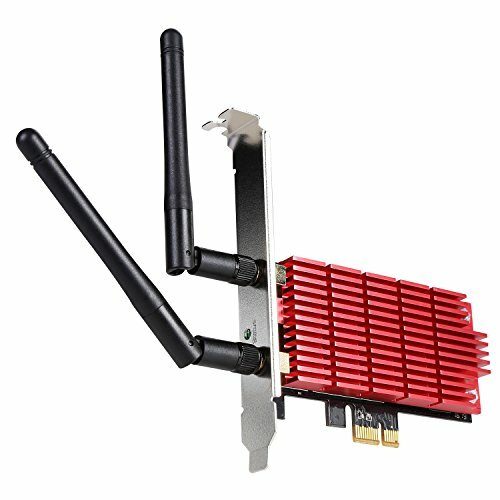 If you are building a new computer and want to stay at or below a certain price point, the TP-Link is the adapter for you, as it’s one of the more affordable wireless network cards around. Owing a bit to this affordable cost, however, is the fact that the router does sometimes have a tendency to overheat after extended use. Another issue that seems to come up with the TP-Link occurs when you use wireless devices, such as mice and keyboards. The TP-Link can sometimes cause interference with these devices, but it only seems to occur when you use these devices on higher settings. Overall, for what you pay, you really can’t go wrong with the TP-Link, as it does everything one would want a wireless adapter to do, and then some. Something that anybody wants out of their internet is more speed, and that is something that users will get with our next product, the Fenvi Desktop adapter. The Fenvi features “Dual-Band” support, which uses multiple wifi frequencies to increase internet speeds. This feature, supported by two detachable external antennas, allows for fast internet speeds of up to 150Mbps when browsing the internet or gaming online. While these speeds are well maintained for the most part while in use, when downloading large files, the speeds can take a drastic dip. This can make it difficult for gamers who download all their games on Steam or GOG, as it increases download times a good bit. This can be overlooked with the fact that, no matter what OS the user has on their computer, the Fenvi will likely be compatible with it. While setting up and using the adapter is a bit more difficult then it should be (not helped with the hard to understand instructions that are included with it), once it is setup, it is certain to work perfectly no matter if you use Windows XP or Windows 10. First off, setup of the device is simple, with users able to connect the device into their PCI port, and a short driver download later, be ready for use. While the easy install is certainly a selling point, what is probably a bigger positive is that the PCE-N15 is compatible with operating systems from both the Windows and Linux families. This makes the adapter a great choice for many custom builds, no matter the preference of OS. Once setup, users can experience wireless speeds that can get up to 300Mbps, depending on the internet service you have. To make things simple for users who use multiple devices, the PCE-N15 can be used as a “Virtual” access point, allowing gaming and other mobile devices to easily connect to your internet. If anything can be considered a knock against the PCE-N15 is that it has a weak wireless range in comparison to other wireless adapters. This requires you to be relatively close to your wireless router, or else you risk weakening your internet’s connection to your computer. That issue aside, there is a lot to love about the ASUS PCE-N15, which is a versatile, and fast, wireless adapter, even if it does not have the greatest of ranges. Our next adapter comes from the computer wizards at ASUS with their PCE-N15 wireless internet adapter. Much like any product you may come across from ASUS, this adapter is one that is sure to please many people. While not perfect, the Fenvi is still a very capable wireless adapter. If you are looking for an adapter that is compatible with your system and provides great speeds, you can’t go wrong with the Fenvi. Rosewill may not have the name recognition as some others on our list, such as ASUS or TP-Link, but don’t let that fool you. The Rosewill N900 adapter is an adapter that can top even the best of adapters. 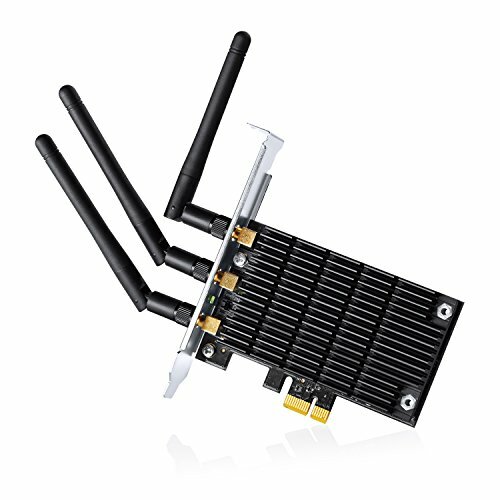 Rose will RNWD-N9003PCe allows desktops / PC to connect to high-speed wireless networks which satisfied all your internet needs in one network card. At first, the Rosewill may not seem like much, as it takes some adjusting to get it working. From moving the antennas to changing settings in your computer, it may take a bit of work to get the Rosewill working properly. When you do get it working, however, you will be more than pleased with the capabilities of the Rosewill, which includes 5Ghz and 2.4Ghz internet speeds thanks to it’s dual-band capabilities. 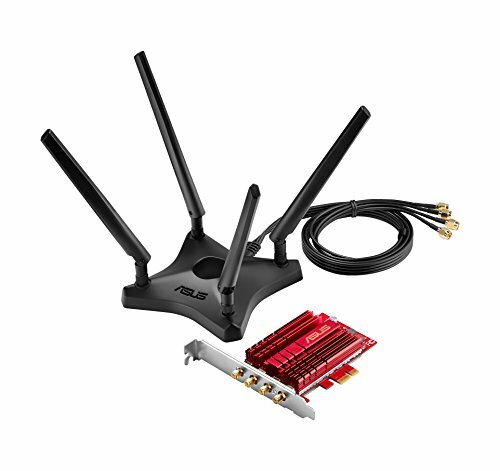 Also, thanks to the three external antennas on the adapter, the Rosewill is able to give the user incredible range, allowing you to use the internet even if your computer is a little distance from your router. If internet security is an issue that you are concerned with, then the Rosewill has got you covered. Capable of supporting even the most advanced of internet security settings, you can rest easy knowing that your internet connection will be safe from cyber predators. Even without the name recognition, Rosewill can more than compete with the big boys. Given great speed and security, the Rosewill N900 will give anyone building a custom computer exactly what they are looking for. Our first entry, the TP-Link N150, while a great choice for those on a budget, was rather limited in features. That changes with our next TP-Link offering – the N900 – with their Dual Band PCI Express adapter. To begin, installation is a cinch, with this TP-Link adapter having the same kind of plug and play capability as their previous offering. To help with the setup of the adapter, the TP-Link comes with a CD that helps you to easily adjust settings on your adapter. Unfortunately, while installation is simple, the TP-Link is not compatible with many current operating systems, nor Linux systems. This means that, while the adapter is great, it won’t be for every computer user. If your computer is compatible, than this TP-Link model will be able to treat you to dual-band speeds of up to 450Mbps. And you don’t have to ever worry about a dip in your internet connection, thanks to the three external antennas that helps to create superior range and stability. While it’s not an adapter for everyone, the TP-Link Dual Band adapter is certainly not going to disappoint. If you want fast speeds and great range, you will want the TP-Link Dual Band PCI express adapter. We now come to the bottom half of our list today, and with it comes more powerful wireless adapters. Such is the case with our next product, the Gigabyte GC-WB867D-I Rev. The Gigabyte is capable of reaching speeds of up to 800Mbps, which allows for nearly seamless wireless internet (depending on your ISP). This means that you will be able to effortlessly game or watch videos, among other activities, with little to no lag from your network. When you are downloading something online, the Gigabyte’s Bluetooth capabilities allows for a greater flow of data through your network. Keeping all that speed maintained is the powerful external antenna on the Gigabyte, which will help to prevent your connection from dipping and keeping it strong. The only real drawback of the Gigabyte comes from the fact that to connect the adapter to your computer, you need the use of an extra USB port. While not a big issue, this can cause some problems to those building a custom computer with only a few USB ports to spare. The Gigabyte, outside this one issue, is a nearly flawless adapter in every other regard. This makes the adapter a great choice for any computer user trying to get the most from their internet. Once again on our list, we see the brand of TP-Link pop up, this time with their powerful Archer T6E model. The speeds that the T6E are able to reach are the fastest on our list yet, with two bands capable of 867Mbps and 400Mbps respectively. This will allow for seamless upload and download speeds across your network, as well as latency free gaming and video streaming. 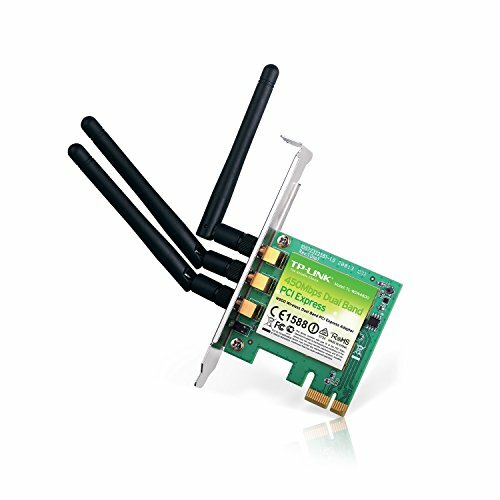 One unique thing about the T6E is that it is backwards compatible with some older wireless connections, including 802.11 a/b/g/n. Despite being backwards compatibility, the does not seem to be compatible with Linux operating systems, which seems like a slight oversight for an otherwise versatile adapter. What is not an oversight is the wide wireless range of the T6E. Even if your computer happens to be on the other side of the house from your adapter, you can be certain that you will not lose connection thanks to the wireless network adapters large and strong signal range. If you use a Linux OS, you’ll have to look elsewhere. For everyone else, however, the TP-Link Archer T6E is capable of giving your computer the strong wireless internet that you have been looking for. We are now in the top three portion of our list, and while the prices may be higher with our next three adapters, we also get more features. Such is the case with this adapter, the ASUS PCE-AC56. Note: For some reason, the plugin we use shows the incorrect price – it should be a live update of the price…but the US price of the adapter is going to run you around $65. This ASUS adapter comes with a few unique features that we have not seen yet on this list, including being able to adjust your wireless signal to prioritize data transferring. This allows you to focus your connection on downloading and uploading, helping you to finish these task in no time. Two other unique features of this adapter is the ability to prevent overheating, thanks to the adapter’s heatsink, and the design of the adapter itself, which helps to eliminate any wireless deadzones. If this wasn’t enough to sell you on this adapter, the fact that, thanks to ASUS’ Broadcom TurboQAM technology, you are able to boost internet speeds even further, likely will. All this comes with the fact that there is little to no downsides to speak of about the ASUS PCE-AC56, making the product near flawless, and a great way to kick off our top three products today. 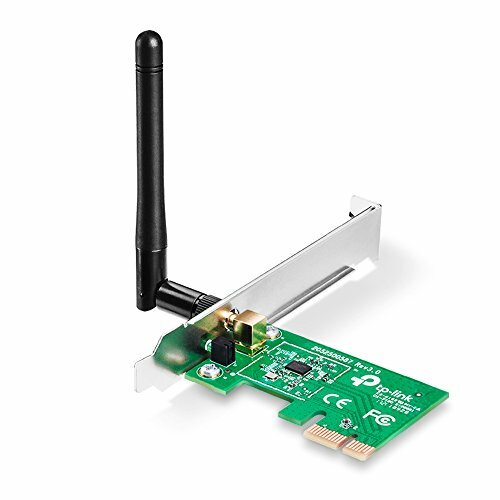 For the fourth, and last time, on our list of PCI Adapters today, we see TP-Link. This time, they attempt to blow the competition out of the water with another of their Archer models, the T8E. To start, this adapter is capable of lightning fast speeds. 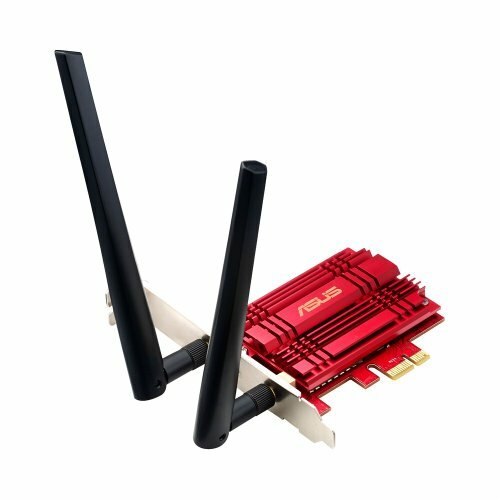 Capable of internet speeds of up to 1750Mbps across the adapter’s dual bands, the T8E is able to give users fast, uninterrupted internet while gaming online or during other activities. If you happen to download a lot of stuff online, then you will like that the T8e offers higher bandwidth options, that reduces download times like never before. Even if you happen to be using an older wireless internet connection, you will still get the same great speeds out of the T8E, as the device is fully backwards compatible. One major drawback that does come out of the T8E is for Windows 10 users, as there seems to be some compatibility issues with the device. While these issues can be fixed, the extra time and effort that goes into making the adapter work properly with Windows 10 can be more than some people wish to deal with. I have found that while the driver hasn’t been updated since 2015, there is a recent video on TP Link’s website that describes how to get through some common troubleshooting issues. All in all, TP-Link proves once again that they know how to make quality PCI network adapters. Dominating nearly half of todays list, if TP-Link is in the brand name, you know you will be buying a quality product. If you’re savvy computerwise, given the price and the speed that the T8E offers – I still think it’s worth it. Note: For some reason, the plugin we use shows the incorrect price – it should be a live update of the price…but the US price of the adapter is going to run you around $120. Individual antennas can also attach directly to PCIe Card for compact installation. Modulation-1024qam. Custom heatsink effectively dissipates heat for improved stability and reliability. Os support-windows 10 86x64, Windows 7 86x64. As you can see above, this is quite expensive for a PCI adapter, so it’s natural to feel some apprehension when you look at the PCE-AC88. If you decide to take the plunge and buy this adapter, you will be treated to speeds like never before, with 2100Mbps and 1100MBps available from the adapter’s dual bands. This, along with an external, multiple antenna base, give you more coverage and speed than most other adapters available. Should something happen to the external antennas, or should you just wish to replace them, you will be happy to know that doing so is simple, as the PCE-AC88 is compatible with most aftermarket antennas. If you are worried that all the power of the PCE-AC88 could cause overheating, worry no more, as the adapter has a custom heatsink, that disperses heat and keeps the device nice and cool. While this ASUS model may be expensive for some people’s taste, the cost is more than worth it for the sheer amount of power that the PCE-AC88 puts right at your fingertips. That concludes our list for today. With ten options at your disposal, you should be able to find the perfect PCI adapter for your custom build. Thanks for reading, and we’ll see you next time. If you like what you read, please join our social media pages and subscribe for more great content. The PCE-AC88 is not supposed to be in the first place because it has stability issues. I paired it with GT AC5300 but the connection drops out randomly. On the other hand, if you are seeking for a reliability, then T8E will do the job right. PCE-AC88 is strong network wise only when it is working right. High end asus products have issues with drivers and the reliability issue is driving me nuts. Today, drivers are poorly programmed. I agree totally, that’s why the cons on the AC88 was noting the asus drivers could cause issues.